If coming from any distance, arrive Monday. Stay until Sunday – and don’t make any plans for Saturday. Stock up on snacks – the keynotes start so early (830) and if you want a decent seat you won’t have time for breakfast. Ditto water. You will return every evening dehydrated. Get a hotel as close as possible. Adding a 10-25 min commute is tough. Do try and catch the keynotes, they are usually worth getting up early for. Be picky about sessions, skip the academic tracks, and go to the ones you are really excited about. Prefer invited sessions. Walk 5-10 minutes for food and you will often escape the worst of the queues. Have a data plan, wifi is often hit or miss. On the Tuesday, hang in the lobby by the main conference hotel (the one connected to the convention centre). Lots of people will be passing through, picking up badges etc. Schedule as many things as possible for that day. Skip the careers fair if you are not a new grad, focus on meeting people rather than companies. Connect with people online before hand (I used Twitter and a slack group for this), and try and meet 1-2 new people (IRL) every day. If there are speakers you are particularly excited about, follow them on twitter before-hand. Another good way to find people is searching the hashtag on Twitter. Have something to connect with people on, that can be a reason for people to find you – I had a lot of fun with technically speaking stickers! Introduce people! 5 of us did dinner before the party which was lovely. 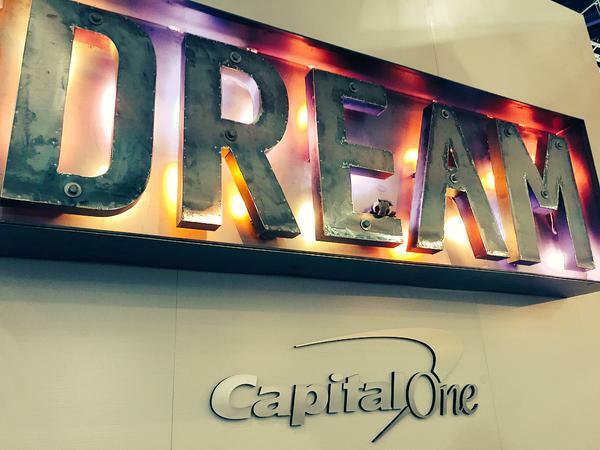 Thanks to Capital One for hosting me as a blogger this year! I had an awesome time.